Linda and her husband, David, opened Wildflower Art Gallery in Wimberley, Texas, on Valentine's Day 2015. Wimberley is a charming town in the heart of the Texas Hill Country, a short drive from Austin and San Antonio. The gallery started in bright green cottage in Olde Towne Plaza on RR 12, just a few steps off "the Square." In December 2015, the Jacobsons relocated the gallery to a different building but still in the same complex. Wildflower Art Gallery is now the first shop on the right as you enter Olde Towne Plaza. It's located next door to another gallery, Art on 12. David manages the gallery and is happy to assist you with your purchases, taking care of shipping and setting up in-home/business viewings. Linda is occasionally in the gallery on Saturdays, depending on her painting and teaching schedule. 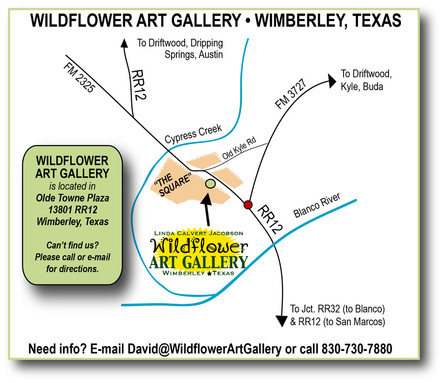 Find Wildflower Art Gallery on your map! If you are coming from the Austin side (Dripping Springs), follow Ranch Road 12 into Wimberley. When you get just past the Square, look for Olde Towne Plaza to your right, between Art on 12 and The Wild West Store. If you are coming from the south (San Antonio, San Marcos), follow RR12 into town. Continue through the stop light where 3237 intersects with RR12 and start looking to your left for Olde Towne Plaza. Visiting Wimberley and looking for stuff to do? Check out the Tour Wimberley website and read about things to do, places to shop, booking for overnight stays, and, of course, learn more about the vibrant art scene!